* $29 per day special based on minimum four (4) day hire. * May not be available on public holidays, school holidays or long weekends. Can be waived via prior arrangement. Ideal Car to rent for Families & those with lots luggage e.g. Golf or Sporting equipment. FREE pickup and set down for Gold Coast Airport and surrounding local accommodation. Baby seats and boosters are available for hire at a nominal charge. GPS are available for hire at a nominal charge. 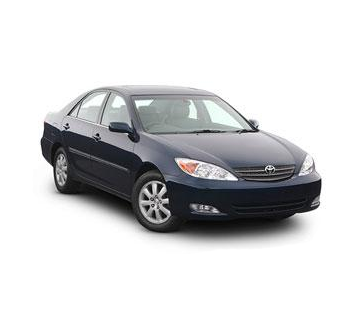 We recommend the Toyota Camry to anyone who is wishing to rent a car who has a large amount of luggage, or who plans on touring with teenagers or adults in the back. Having a larger engine makes touring more comfortable & for a car of its size the Camry has great fuel economy. Taking advantage of our Off Peak Rates means you can afford to hire the Camry for just a few dollars more per day then the standard Hyundai Getz. That is why the Camry is one of our most sought-after car rental options. Space, comfort & the peace of mind of knowing all our vehicles come with a free 24 hour breakdown assistance, means you can simply enjoy your next Gold Coast holiday or business without the usual worries associated with car rentals. Jetsetter Car Rentals is conveniently located right across the road from the Gold Coast Airport. That means pick up & drop off is very convenient. We also have a personal ‘Pick-up & Drop Off’ service available. With all of those advantages in mind it is little wonder that Jetsetter Car Rentals has been the first choice in Gold Coast Car rentals for those in the know for over a decade. Book your next Gold Coast Car Rental with Jetsetter Car Rentals. 24 Hour Breakdown Assistance included for Free. Spotlessly Clean Inside & Out. Air-conditioning, power steering and stereos or CD players. Great Rear Seat Leg Room.